Next March, Tate Britain will open a major exhibition about Vincent van Gogh (1853-1890). The EY Exhibition: Van Gogh and Britain will be the first exhibition to take a new look at the artist through his relationship with Britain. 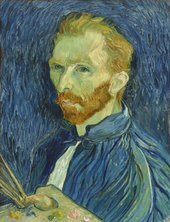 It will explore how Van Gogh was inspired by British art, literature and culture throughout his career and how he in turn inspired British artists, from Walter Sickert to Francis Bacon. Bringing together the largest group of Van Gogh paintings shown in the UK for nearly a decade, The EY Exhibition: Van Gogh and Britain will include over 45 works by the artist from public and private collections around the world. They include Self-Portrait 1889 from the National Gallery of Art, Washington, L'Arlésienne 1890 from Museu de Arte de São Paolo, Starry Night on the Rhône 1888 from the Musée d’Orsay, Paris, Shoes from the Van Gogh Museum, Amsterdam, and the rarely loaned Sunflowers 1888 from the National Gallery, London. The exhibition will also feature late works including two painted by Van Gogh in the Saint-Paul asylum, At Eternity’s Gate 1890 from the Kröller-Müller Museum, Otterlo and Prisoners Exercising 1890 from the Pushkin State Museum of Fine Arts, Moscow. Van Gogh spent several crucial years in London between 1873 and 1876, writing to his brother Theo, ‘I love London’. Arriving as a young trainee art dealer, the vast modern city prompted him to explore new avenues of life, art and love. The exhibition will reveal Van Gogh’s enthusiasm for British culture during his stay and his subsequent artistic career. It will show how he responded to the art he saw, including works by John Constable and John Everett Millais as well as his love of British writers from William Shakespeare to Christina Rossetti. Charles Dickens in particular influenced Van Gogh’s style and subject matter throughout his career. L'Arlésienne 1890, a portrait he created in the last year of his life in the south of France, features a favourite book by Dickens in the foreground. Tracing Van Gogh from his obscure years in London to the extraordinary fame he achieved in Britain in the 1950s, the exhibition will show how his uncompromising art and life paved the way for modern British artists like Matthew Smith, Christopher Wood and David Bomberg. It will conclude with an important group of portraits by Francis Bacon based on a Van Gogh self-portrait known only from photographs since its destruction during the Second World War. The exhibition will provide an opportunity to look afresh at well-known works by Van Gogh, through the eyes of the British artists he so inspired. To artists like Bacon, and the British public at large, Van Gogh epitomised the idea of the embattled, misunderstood artist, set apart from mainstream society. The EY Exhibition: Van Gogh and Britain is organised by lead curator Carol Jacobi, Curator of British Art 1850-1915, Tate Britain and Chris Stephens, Director of Holburne Museum, Bath with Van Gogh specialist Martin Bailey and Hattie Spires, Assistant Curator Modern British Art, Tate Britain. It will be accompanied by a major catalogue from Tate Publishing and a programme of talks and events in the gallery. The EY Exhibition: Van Gogh and Britain is the eighth ground-breaking exhibition supported through The EY Tate Arts Partnership. This nine year partnership makes EY one of Tate’s largest and longest-standing corporate supporters and this support extends to corporate memberships around the country. EY is a global leader in assurance, tax, transaction and advisory services. The insights and quality services we deliver help build trust and confidence in the capital markets and in economies the world over. We develop outstanding leaders who team to deliver on our promises to all of our stakeholders. In so doing, we play a critical role in building a better working world for our people, for our clients and for our communities. EY refers to the global organization, and may refer to one or more, of the member firms of Ernst & Young Global Limited, each of which is a separate legal entity. Ernst & Young Global Limited, a UK company limited by guarantee, does not provide services to clients. For more information about our organization, please visit ey.com/uk.